As I began my search for a fabulous Orange Creamsicle cake, I discovered that many recipes start out with a cake mix and then add orange gelatin. This was NOT what I had in mind. I wanted something with the flavor of FRESH oranges, not something that was artificially "orange flavored". Know what I mean? Not only that, I wanted something with HUGE orange flavor. I wanted to be SLAMMED with intense orangeness at the very first bite. Basically, I wanted to eat an orange in the form of a cake. Well, Ladies and Gentleman, here it is! Oh sure, it may look like your average yellow cake when you slice into it, but wait 'til you TASTE it! It's like a burst of sunshine on your taste buds! I'm not even kidding. Cream together sugar, butter, and orange zest. Add eggs and vanilla. Mix well. In a separate bowl, mix flour, salt, baking powder, and baking soda. Add alternately with orange juice to creamed mixture, beginning and ending with the dry mixture, beating well after each addition. Beat for 2 minutes. Pour into 2 greased and floured 9" cake pans, a 9x13 pan or even paper lined muffin tins for cupcakes. Bake for 25 to 30 minutes or until toothpick comes out clean. (When baking cupcakes, reduce your baking time to 10-15 minutes). 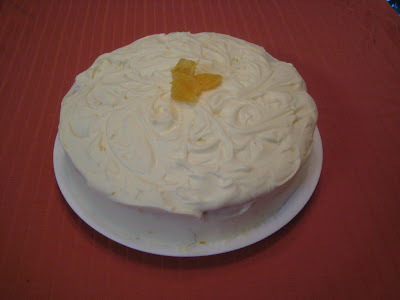 Simply add some grated orange zest or orange extract to regular Cream Cheese Frosting. I'd say maybe about 1 or 2 tsp of grated zest or about 1/2 tsp orange extract should do it. If you like more, add more! The key to this cake is the orange zest. Yes, the juice adds great flavor, but the zest adds bigger flavor without adding any liquid. You could substitute orange extract (probably about 1 tsp) for the zest, but you wouldn't get that FRESH flavor that I mentioned. Oh, and one other thing...YES, the amounts of the ingredients are correct. Usually one doesn't use so much baking powder, but trust me, it all works.